Arafura’s primary products are Rare Earths. Our products are used in applications including catalytic converters in automobiles, catalysts in crude oil refining, consumer electronics, energy efficiency lighting, optics, super alloys, advanced ceramics and high strength magnets, which are found in hard disk drives, automobile applications such as electronic power steering motors, seat adjustment motors, fuel and water pumps, airbag sensors, main drive motors in electric vehicles (EV), and more. Arafura is focused on producing a high purity NdPr oxide product for use by advanced magnet and magnet alloy customers as its flagship product. The NdFeB permanent magnet market is the largest market for NdPr oxide and Arafura’s product mix is ideally suited to meeting demand from leading magnet producers, as well as automotive and wind turbine end users. Arafura’s La oxide product is destined for use in refining catalysts for fluid cracking of oil and the Cerium product will find application in catalysts for transportation emissions control and LCD glass polishing. After the pilot production of high purity rare earth oxides (REOs) in 2013, Arafura produced finished high quality REO products for customer evaluation and unity on product specification. The project will also produce a marketable phosphate byproduct, namely a 54% P2O5 phosphoric acid product (MGA) suitable for the granular fertilizer market or upgraded to a higher valued phosphate product. High quality Arafura products will be available for future rare earth separation piloting and available for customer evaluation. Please contact us for further information on our products or if we can assist with your product enquiries. 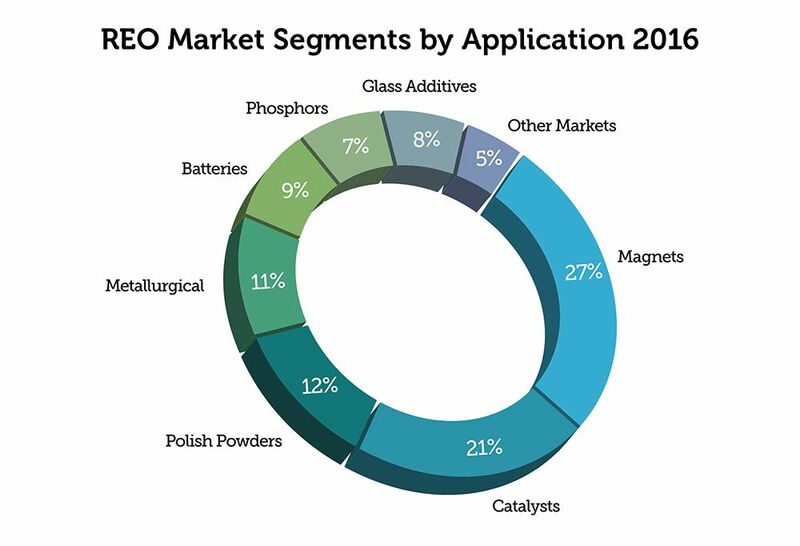 Rare earths enable and facilitate magnetic, optical, catalytic, and electronic applications in key growth markets such as clean energy technology, automotive technology, and consumer electronics. Additionally, the oil refining, healthcare, lighting, industrial, aerospace and robotics sectors are expected to contribute materially to global rare earths demand through to 2025 and beyond. Permanent NdPr magnets are shaping the future of the automotive and wind power energy generation industries. Other important uses of NdPr magnets include e-bikes, air-conditioning, consumer electronics, and robotics. Most significantly in terms of estimated future demand for NdPr oxide, maturing powertrain technologies in the automotive sector are driving growth for permanent magnet electric motors used in Hybrid Electric Vehicles (HEV) and Battery Electric Vehicles (BEV). With regulatory changes, technological advancements, and consumer preferences all coming into play, leading automotive manufacturers across the world are increasingly eschewing traditional petrol and diesel combustion engines for more efficient and cleaner HEV and BEV alternatives. The magnet market segment is the largest rare earth market by volume and value followed by the catalyst and glass polishing markets. These sectors accounted for 60% of rare earth demand in 2016.